With the proliferation of thousands of FTP, Podcast, and other 'me-too' sites on the Internet, we can no longer recommend any but a handful of Golden Age Radio providers and these only because we're first-person familiar with their motivations and mode of operation. As more preservation-motivated FTP sites arise, we'll attempt to include more choices in the future. Please feel free to notify us via any of our hundreds of 'Comments Please!' 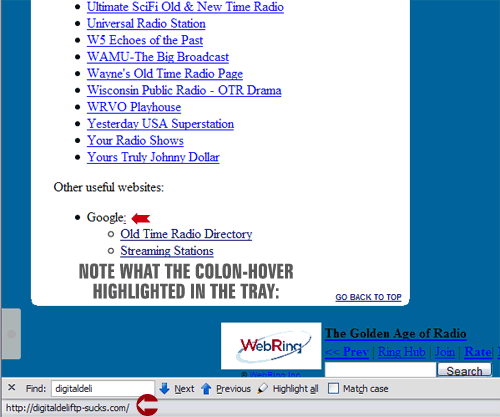 buttons throughout the site if you discover a Vintage Radio FTP resource or site of interest. We'd be happy to post it here. It's unfortunate that Golden Age Radio Preservation has been supplanted by thousands of low quality, highly commercialized 'otr' sites and groups--so much so, that the initials 'otr' are beginning to represent the lowest common denominator of the vintage Radio collecting community. Click on the 'Transcriptions' button at the right for more quality choices. We would respectfully suggest that if you truly love, respect, and honor the Golden Age of Radio, that you seek out and support only those sites and providers who genuinely promote--and contribute to-- Golden Age Radio Preservation (e.g., they actually contribute something to Golden Age Radio Preservation, rather than simply passing along a collection of BitTorrent file dumps from other BitTorrent users). The one recurring theme We'd leave with you is to absolutely stay away from any site offering audio books or extravagant numbers of available recordings. Simply put, they're in no way representative of the vintage Radio preservation movement. There's a right way and a wrong way to operate an FTP service. OTR distributors such as OTR Network Libary, OTRDepot.com, Tennessee Bill OTR, LibSyn.com, OTRDays.com, OTRCat.com and SpartaRadio.com represent everything wrong with this otherwise uplifting hobby. WE've grown from an initial five pages, to as many as 5,600 pages, what with galleries, cover art, CD-Labels, spot ads, show listings, articles, logs, etc., but are we somehow perceived as a threat to OTRCat's multi-thousand dollar monthly operations on the Internet? Can the little Digital Deli Online with no advertisers, no sponsors, no Google Ad-Sense, or Google Ad-Words, possibly be a threat to OTRCat, SpartaRadio, WikiPedia OTR, LOFCOM.com, Old Time Radio Researcher's Group, or any of the other sites who perceive us a competing voice or choice to them? Apparently so. They're 'OTR'. We're Golden Age Radio. The above examples should give you an indication of the stark contrasts between commercial OTR hoarders and altruistic Golden Age Radio preservationists. The two camps are so far apart on the continuum of vintage radio history preservation as to be laughable by way of any comparison. Link placement on Search Engines? We don't pay for any. Ad-Sense or Ad-Words traffic or per-click income? We ain't got any. Market share? That's laughable, we definitely ain't got any of that. Nor do we seek any level of 'OTR' market share to begin with. We're an information and Radio History site. Venality? Mischief making? Megalomaniacal empire building, such as the OTRR? Or perhaps it's simply that, from our first six months on the internet, we ended up on the first page of any Google Search for Golden Age Radio, the first page of Yahoo for any search for Golden Age Radio, and the first pages of both MSN and Alexa, for either Golden Age Radio or Old Time Radio. Alexa is the most interesting example of all. We've literally begged them to remove us from their Old Time Radio category, going back almost 6 years now, and they still routinely list us among the top eight Old Time Radio websites on the Internet. Now really, how do you answer that? What is it that gripes these 'commercial OTR' people so much? Our success based on nothing other than Google's Web Crawls? Devoid of paying Google for placement, generating distracting, annoying AdSense or AdWords nonsense all over our current 4,600 pages? Or for that matter, annoying, distracting banner ads, or pop-ups all over our pages? What do any of those things have to do with educating our visitors on preserving and enjoying Golden Age Radio? Nothing. Exactly! You may well ask why we've wasted so much web space and effort recounting this 'commercial OTR' nonsense. The bottom line--for us, anyway--has been from the outset of the first incarnation of our five-page Digital Deli Online, to raise the bar in this endeavor. To attempt to get all of the more questionable elements of the various 'commercial OTR' factions to remember what we're all striving for in the end--hopefully, anyway: a concerted, well researched, well documented, preservation effort to save, rehabilitate, preserve, and obviously enjoy the hundreds of thousands of Golden Age Radio Recordings that still remain--un-downsampled, un-clipped, un-spliced and as close to their original fidelity as technology and art allow. And believe me, transcoding Electrical Transcriptions discs and reels from the Golden Age of Radio is as much an art as a technical skill set. As always, we welcome your thoughts, impressions, or criticism--pro or con. You need but message us on any of the hundreds of 'Comments, Please!' icons throughout the site. "AMERICAN RADIOWORKS® is the national documentary unit of Minnesota Public Radio. ARW is public radio's largest documentary production unit; it creates documentaries, series projects, and investigative reports for the public radio system and the Internet. ARW is based at Minnesota Public Radio in St. Paul with staff journalists in Washington, D.C., San Francisco, C.A., and Durham, N.C."
Frank LaRosa's collection of wierd and interesting (some Golden Age) MP3 recordings.